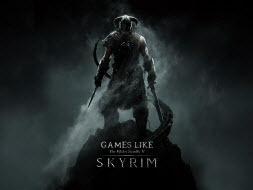 RPG Games Like Skyrim '+g+"
Check our list of recommendations for open world role playing games like Skyrim which provide similar gameplay. Set 200 years after Oblivion, Skyrim is the 5th installment in Elder Scrolls series where the player takes the role of the last living DragonBorn who must increase his strength and abilities so that he can defeat Alduin, a Dragon before he can destroy the world. Don't forget to mention if we miss any games as we keep on updating this list. Oblivion is the fourth installment in The Elder Scrolls action fantasy video game series. Oblivion's main story revolves around the player character's efforts to thwart a fanatical cult known as the "Mythic Dawn" that plans to open the gates to a realm called "Oblivion". Kingdoms of Amalur: Reckoning is a single-player action adventure role-playing game. The game starts with the resurrection of the dead player through 'The Well of Souls' by a gnome known as Fomorous Hugues. The player must now try to bring order or create chaos to the kingdom. Dark Souls is an open world action role-playing video game. The game takes place in the kingdom of Lordran, where the player character is an undead chosen to make pilgrimage. Dark Souls has a minimalistic plot and much of it is interpreted by the player on their journey. Red Dead Redemption,......if you can think of more, then don't forget to mention it in comments.